In the Lid Prob tab of the Predict window, you can configure and display the tracks for lithofluid probabilities. Click the Add Row icon (+) to add one or more lithofluid probability tracks. At Title, type a name for the track. The title will be displayed above the track. At Lid Prob Process, select the LithoFluid Probability process created in the Process tab (see LithoFluid Probability) to use when calculating probabilities. Specify the track width (in pixels) in the adjacent box. A zero value (0) means autofit. To hide the curve track, click the green circle to the left of the Title column. The green circle will turn amber. Select the Use Well's Water Bottom check box to use the water bottom of the selected well. See the following image for examples of the corresponding lithofluid probability tracks. 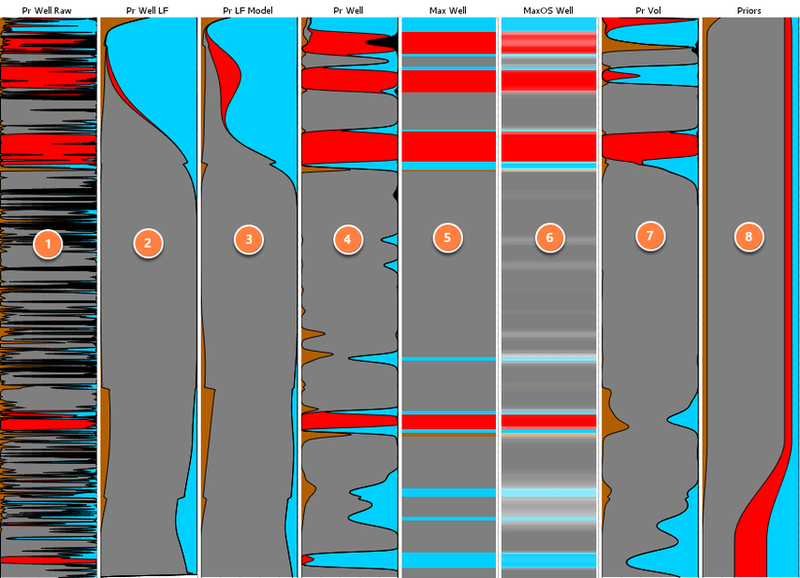 Lithofluid probability calculated using raw well curves. Lithofluid probability calculated using low frequency filtered well curves. Lithofluid probability calculated using a user specified low frequency model. Lithofluid probability calculated using well curves upscaled to the seismic bandwidth (see Applying Filters and Including Result Curves). Maximum likelihood lithofluid calculated using upscaled well curves. Maximum likelihood lithofluid (with intensity) calculated using upscaled well curves. Maximum likelihood lithofluid calculated using user specified absolute volumes. Lithofluid prior probabilities being used by the selected lithofluid probability process. 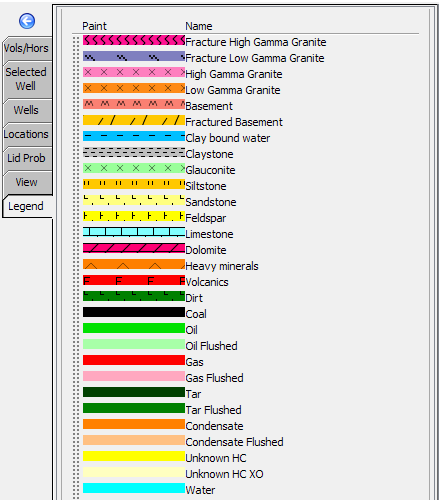 Open the Legend tab to view the colours that correspond to the lithologies in the Petrophysics track. Click and drag the entries up or down to arrange them. By default, this list is arranged in alphabetical order.